We aim to carry the largest variety of deck enclosures available in Southern Alberta. With how quickly our seasons change, we want you to enjoy your patio and deck to it's fullest. Whether it's a 4-season sunroom or a patio cover, every season is a reason for a DSP product! Whether it's a Desert Sun Patios product or a sunroom that you assembled yourself, we can replace hail damaged patio roofs, sunroom roofs and pergolas! Love the outdoors so much you want to bring it indoors? Then a sunroom is the right choice for you! Imagine a serene, warm, peaceful oasis, right there in your home; waiting for you, each and every day. No matter the weather outside, a sunroom is always welcoming and bright. 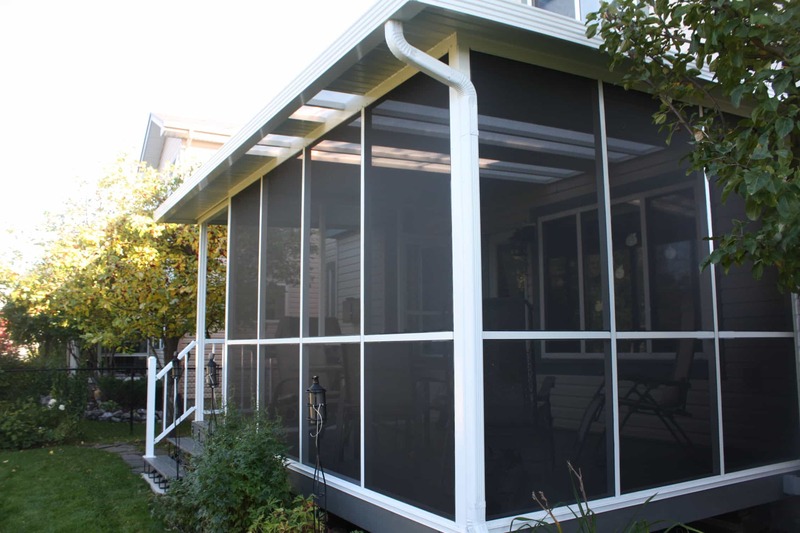 Add a patio cover and walk from your sunroom to your barbeque year round! With the world moving in an environmentally conscious direction, and with Alberta’s (and soon to be national) carbon tax placing additional cost on energy, many people are looking for ways to reduce not their energy usage. Luckily, a sunroom provides an opportunity to be both environmentally conscious while reducing your overall carbon use. We strive to provide the highest levels of customer service. Whether you're ordering a DIY kit, or we're installing your brand new living space, we are committed to keeping you satisfied. Let our friendly staff help you obtain the patio of your dreams! Simply put, we love the outdoors. We love family and friends, and we love our homes. It is our mission to help our customers transform their everyday houses into “Resort Style Home Living”. We have the best clients and we love feedback. We couldn’t be happier when we hear the comments we get from our satisfied customers. We hope you will join them! Is a deck cover or enclosure right for you? Find out if either a sunroom, screen room, patio cover or pergola is the right addition for you and your house. 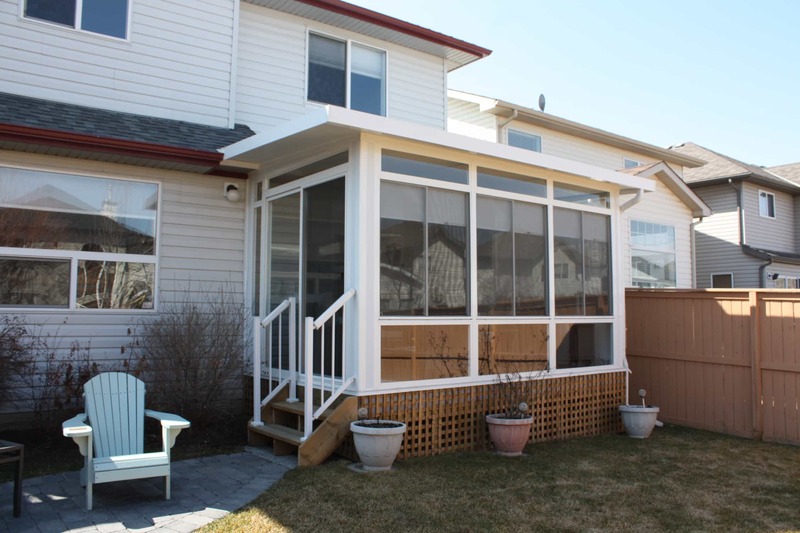 Enjoy the sun while protected from the elements year round with a new sunroom. From viewing the grandkids playing in the garden to Christmas with a view. Our sunrooms have you covered. Enjoy the outdoors while protected from unwanted insects. All the fresh air and the view while protected from pests. Have family and friends over for a BBQ and enjoy! A patio is a beautiful outdoor living space. With a high quality covering it becomes a versatile space even when the weather doesn’t cooperate. Get out and enjoy your patio more often! Pergolas are a beautiful addition to any patio deck or garden. Add shade and protection, complement your house, and add value. Enhance your outdoor space today! Hybrid Patio Covers are the perfect combination of protection, style and function. Enhance your outdoor living space with a new hybrid patio cover and add value to your home! Upgrade your park model or trailer with a protected outdoor living space. Desert Sun has years of experience adding value and function to all types of living spaces. Ask us about our custom services! Desert Sun Patios has been installing Sunrooms, Screen Rooms, Pergolas and more for over 18 years. We live and love Calgary and Southern Alberta. Contact us today! Our overall experience with Desert Sun Patios Was very good! The service and quality of product was excellent. We appreciated Marty’s attention to detail. Cost was competitive and communication was positive! Blake was very professional and knowledgeable. Bob was very professional and willing to stop by our house in Red deer to do a measurement/estimate. Marty was very professional/courteous, ensure work carefully completed and done right the first time. Work was completed sooner than expected. Great product, people and service. Thanks to Blake for his follow-up and excellent installation and service by Jeff. We would not be enjoying our west facing deck on these hot days if not for Desert Sun. This is a very profession and honorable company to deal with. Bob was very professional and always up front with us. Mike, the installer did a first class job in installing our sun room. We had a problem with a leading roof. Bob and Mike stayed with us all the way and kept coming back until the problem was solved. We highly recommend this company. Why Choose Desert Sun Patios? 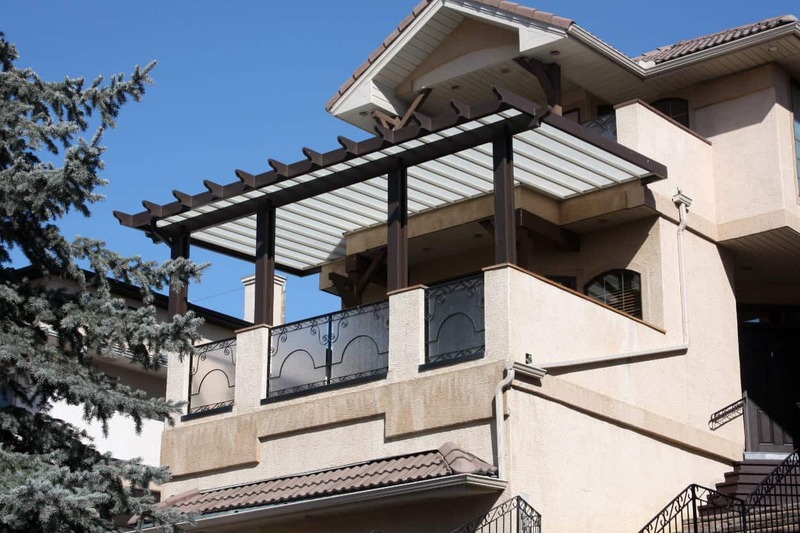 When you choose Desert Sun Patios, you are choosing deck additions that both look beautiful as part of your home and meet the extreme weather challenges the Calgary climate can throw at it. All our employees, from our front desk staff to on-site technicians, excel in providing excellent customer service, and aim to build the best additions to your home. 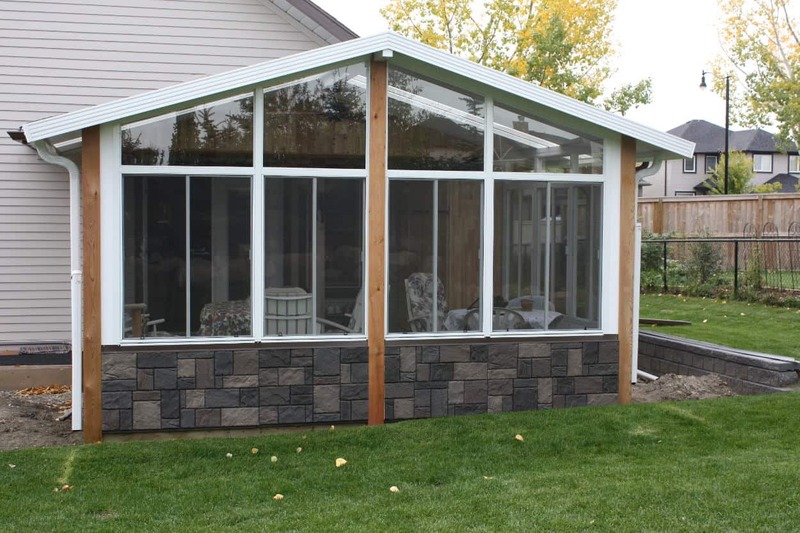 Our builders at Desert Sun Patios are all experts in their fields and have lived in Calgary for many years. They know what to expect from an Alberta winter, from the strong winds that blow hard across the city, to the deep snow that comes with a clipper storm, and they are prepared to work through all conditions to ensure your sunroom installation is completed on time. We have been operating in Calgary since 2001, and with so many years of experience behind us, our team brings a lot of local knowledge to your project. This includes giving pointers on building codes and regulations, helping you to protect your new investment against the elements and working with manufacturers to get you the best prices possible. All of this comes as part of the package when you order your installation through Desert Sun Patios. One of the biggest areas that we pride ourselves in is the attention to detail we give to each project. This includes answering any question that you have about the installation, including you in every decision, from the types of glazing to the thickness of the insulation, and ensuring that both the inside and outside of the project look perfect before we leave you to enjoy your new Desert Sun Patios sunroom. After your installation has been completed on time and to your satisfaction, our highly trained staff will still be on hand to answer any questions, work with other local contractors who may be doing internal work on your sunroom, and to come and fix problems that occur soon after the installation. We understand the trust you place in us to create a unique and personalized deck for you, and we want to be with you on each step of the journey and beyond. Over the last 18 years, Desert Sun Patios has been the GO-TO Patio cover builder in Central & Southern Alberta and we have hundreds of satisfied, happy and amazing clients. Desert Sun Patios installs patio covers and other additions throughout Central & Southern Alberta and all of our products have been approved by the many parks in Alberta and all of our products have the engineering to support the required permits for your specific jurisdiction. More info. You can pick from a full line up of high quality products to achieve what ever your needs may be, from a simple patio cover or screen room, to year round sunroom options, we’re here for you. Our friendly staff make sure they understand both you and your project. We come in person to meet you, measure your space, and do a proper professional estimate. The result: a living space you can enjoy for years to come! Was very impressed how the patio cover turned out, it really finishes off the sundeck. Dustin was very customer oriented, which you don’t see a lot anymore from companies, during the process from when I went into showroom to 2 1/2 months later when finished. Anytime I had questions always recieved a return within a day or two if unable to reach the person I wanted to talk to. Thank-you Dustin for coming out so many times and being so patient with me and answering my million questions and most of all, willing to make things right. Bob thank-you for taking the time to answer my questions over the phone. Also thank-you Don for installing my flat pan patio cover. You did a beautiful job, you know you stuff and I appreciate it. Last but not least, thank-you Jeff for doing all the little touch-ups. Your a great young man. Desert Sun you Rock!!!!! Staff were very professional and knowledgeable. I live in Red Deer and they came out to stop by to give us a measure & estimate no problem. Over all experience was great, friendly, and timely! Very pleased with our final product, we are very excited to now enjoy it. Is a deck addition right for you?